Thermal imaging cameras are excellent tools for home inspections because they can measure the heat energy (infrared wavelengths) an object emits. How is this helpful? For one, home inspections conducted with infrared cameras do not require you to cut open walls or tread in potentially unsafe areas because they can measure the target’s heat from a distance away. This is particularly helpful in that it is not only safe for you and non-invasive, thermal imaging scans can reveal things that normal cameras or even the naked eye can’t see. They can point out issues such as water leaks, moisture, air gaps & insulation gaps, overloaded electrical services & most importantly, heat loss. All of these problems can lead to thousands of dollars in damage to a property, which is extremely beneficial to know before purchasing a particularly old home or investment property. Knowing issues before they happen is always preferred to the alternative, before its too late — for your finances OR your health. Handheld thermal imaging cameras for home inspections can detect a wide array of issues in a cost effective manner. When it comes to a purchase such as a home or investment property, a nominal amount for a thermal inspection can save you literally thousands in the long run in home repairs. Below is only a small list of potential issues thermal imaging cameras can detect and images illustrating how they would appear in thermograms when performing thermal imaging analysis. Handheld thermal imaging cameras for home inspections can easily identify mold & moisture damage in hidden areas, or even in plain sight that the human eye cannot detect. Water leaks can be a serious two-fold issue. For one, water leaks can lead to structural integrity issues in roofs, floors, ceilings & beams, which in turn can lead to more property damage than you bargained for. Water leaks & moisture can also be particularly hazardous to your family’s health, because they can foster the perfect environment for molds to grow unchecked. Molds can be an allergen that causes irritations in individuals as small as a runny nose or as fatal as Anaphylaxis. Water leaks and mold should be dealt with in an expedient manner. Handheld thermal imaging cameras for home inspections can point to leaking air and drafts around windows and doors. Insulation gaps are one of the biggest issues with home heating. Air drafts and heat loss can significantly increase energy costs because your money is literally going out the window. Since poor building construction and air leaks are often extremely difficult to identity, having a thermal imaging camera is a huge benefit. It can quickly identify the problem areas around windows, doors & flooring, pinpointing the exact areas of your home insulation that need to be improved. In this picture, you can plainly see all of the cool air escaping beneath the door. This both wastes cool air in the summer and warm air in the winter, contributing to higher heating & cooling bills. When basic home inspections are conducted, the inspector generally uses his eyes and hands, not much else. The inspector can see what type of electrical service is implemented in the home, whether its a 15 or 20 amp service. He can identify wiring types, circuit breakers as being functional, and use multimeter gauges to measure amps being emitted from wall outlets. But what he can’t see is if a certain circuit breaker may be overheating. With a home inspection being conducted as preventative maintenance, over-tasked or dated circuits can be easily identified. It’s bad enough when a home inspector tells you that your house is filled with pests such as termites, beetles or even rodents. But seeing the entire picture of just how much damage that varmints can cause is important in determining just how much repairs need to be made. Thermal imaging cameras can point out gaps in beams and tunnels through insulation and walls of the home. Knowing where the pests are hiding is key to stopping them in their tracks, at the soonest possible time before any more damage is done. RAZ-IR MAX infrared cameras are a robust, low cost and easy to use solution for thermal imaging home inspections. This infrared camera line features simple to follow menus, CCTV & thermal image fusion and digital image storage with voice recording for notes. This camera is able to make multi-spot radiometric temperature measurements up to 250ºC and comes with RAZ-IR analysis software for evaluating your data. The RAZ-IR Pro infrared camera is the smallest handheld thermal imaging camera for home inspections available from SPI Corp with HUGE features. Its unique cell phone design makes it small enough to fit in the palm of your hand or into your pocket. This is a truly high end infrared camera at a low price, making thermal imaging technology available for anyone who needs it. The RAZ-IR Pro has real time 60hz thermal video imaging performance, multi-spot temperature measurement, digital image storage, voice annotation and an integrated laser pointer, and comes with the full RAZ-IR analyzing software suite for evaluating your data. 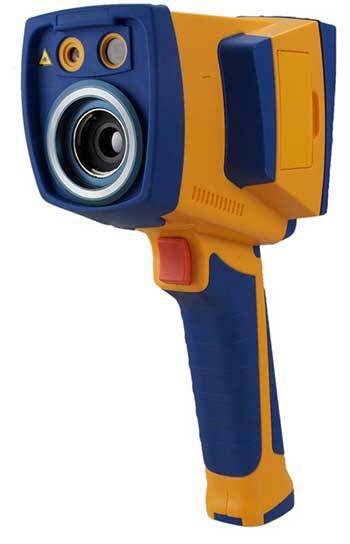 We have many more handheld thermal imaging cameras for home inspections. Click here to view our RAZ-IR product line catalog.